See why hundreds of coaches use Satori to automate admin, deliver stellar client experiences, and grow their coaching practice with confidence. 30-day free trial. No credit card required. Satori gives you everything you need to start, grow, or streamline your online coaching practice—in one beautifully simple package. We’ve designed it from the ground up to be perfect for coaches so you can relax knowing everything’s taken care of. It’s like having a VA to take care of your practice—for a tiny fraction of the cost. Satori makes it easy to start or grow your coaching practice online. Bundle multiple sessions into a single package. Leverage packages in your marketing. Deliver a smooth and professional enrollment experience. Automate tracking and follow-up. Brand your landing pages, emails and client login area to build trust and recognition with every interaction. 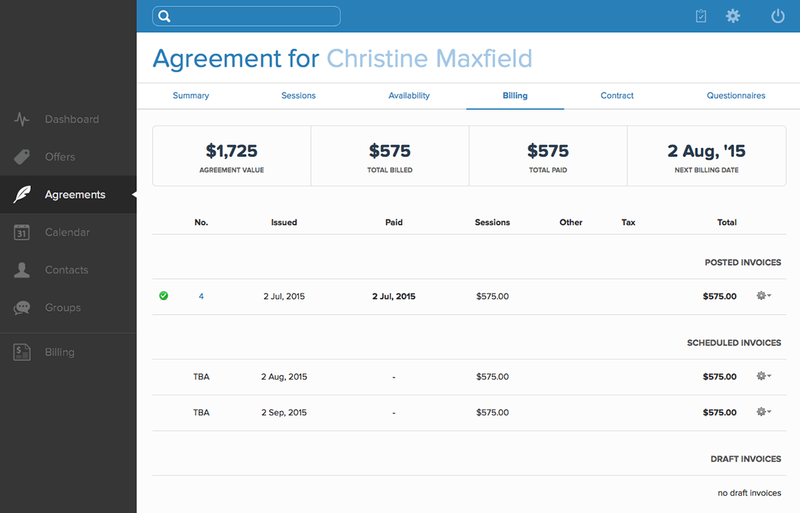 See everything your client sees during the sign-up process and feel confident you’re delivering a smooth and professional enrolment experience. Invite bookings from your website, blog, newsletter, email signature or anywhere else you can post messages online. Adding links and buttons is as easy as copy-and-paste. Use dedicated offer landing pages to lift conversions and communicate value more effectively—or create private offers to share with selected clients and groups. Connect Satori to your AWeber or MailChimp account to send auto-responses, drip campaigns, or email newsletters to your Satori contacts. Add clients to your list when they sign up for selected offers. Nurture leads, keep in touch, and win more repeat business. Create custom questionnaires to support your coaching. Discover motivations, set agendas, and check in with accountabilities. Show up prepared and deliver more effective coaching in every session. Invite clients to give a review at just the right time. Collect testimonials, build social proof, and win more clients. The Satori dashboard gives you clear, actionable feedback you can use to improve sales performance, track financial accounts and fix revenue problems before they happen. Stop leaving money on the table and start moving the needle on your business. Deliver stellar client experiences with ease. With silky-smooth client on-boarding and automated follow-up, Satori helps you show up like a pro from the start so your clients always feel taken care of. Satori integrates all aspects of coaching client management into one beautifully streamlined package so staying on track is simple and easy. Build client profiles and track communication. Personalise coaching programs and agreements. On-board clients quickly and smoothly. Track appointment schedules and remaining sessions. Track billing history and scheduled payments. Deliver questionnaires and capture session notes. Impress clients with a smooth, professional experience. Quit losing time and sanity with multiple apps and scattershot management. Satori gives you one place for all your client info so staying organised is easy. Create custom agreement documents (or paste in your existing docs complete with formatting). Use dynamic merge fields to automatically tailor agreements to specific offers or clients without manual edits. Every client is unique. Satori makes it easy to tailor coaching packages to individual clients and email personalised agreement proposals in just a few clicks. Make a stronger call-to-action with that personal touch. Create custom questionnaires to support your coaching. 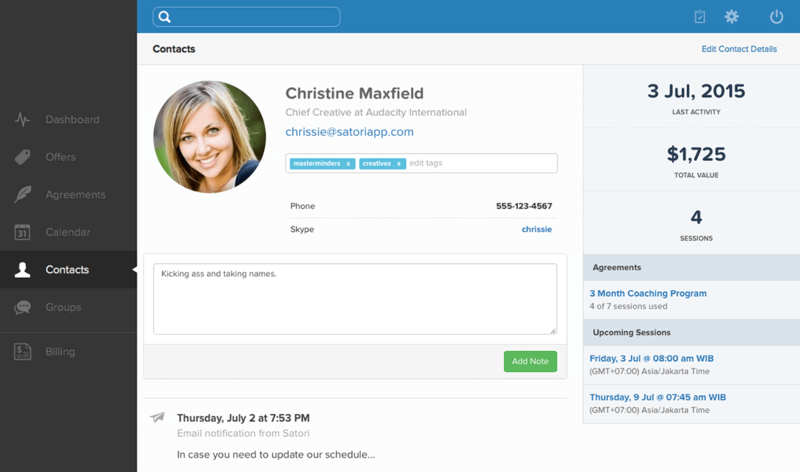 Satori emails your client before each session, capturing responses to their profile. Discover motivations, set agendas, and check in with accountabilities. Show up prepared and deliver more effective coaching, in every session. Satori automates follow-up, and keeps track of client communication. Booking confirmations, session reminders, questionnaires, invoices and other notifications are logged to your client’s profile so you can see exactly what your clients have received and when. Satori empowers your clients to self-manage through the secure client login area. Clients can manage schedules, review agreements, access billing history and update their profiles. It’s SSL encrypted and password protected to keep your clients safe. Satori groups help you manage coaching schedules for multiple members and keep everyone in the loop. Run workshops, classes or coaching groups and reach a wider audience of potential clients. Try Satori FREE for 30 days. No credit card required. Satori easily saves my team 25 hours per month. 100% pro. Love it for all my private clients. Satori eliminates emails, empowers my clients, and cultivates a sense of professionalism. It's genius. Satori has given me a massive buzz and excitement to grow my client numbers, and really cement for me: I AM a Coach—no more playing small for me! I decided I want to automate as much as I can because the time I have available to me has been cut significantly. Satori has eliminated so much back and forth and I feel more professional to boot. LOVE it! Not having my scheduling software in place has completely held me back in growing and managing my business and our call this morning changed everything. I feel so much more confident and professional with Satori—I can't imagine not using it. A breeze to make happen… Makes it all very streamlined and easy. Satori is seamless, beautiful and easy to use—by far the best and most cost effective tool for coaches. I recommend you to everyone. Love Satori and it's made such an impact in my life. My business went from a trickle and me feeling overwhelmed to bustling and feeling like everything is super easy. Online bookings and auto-billing has changed my world. 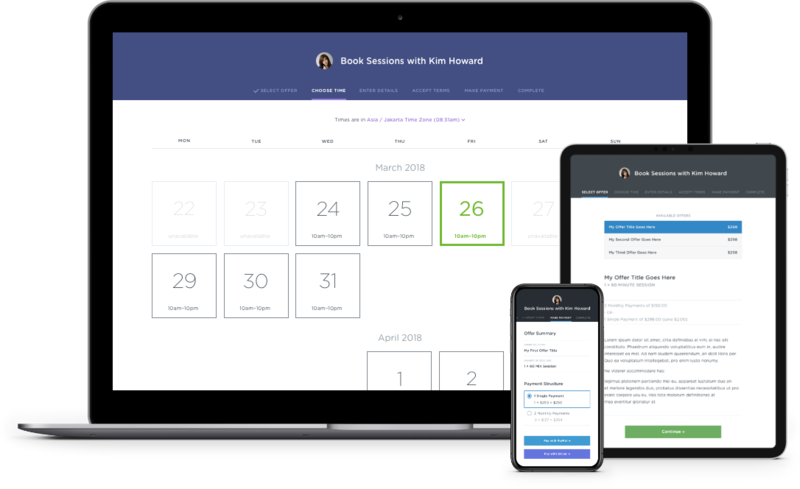 Designed from the ground up specifically for coaches, Satori’s simple and robust scheduling tools give you everything you need to streamline your practice and put bookings on autopilot quickly and easily. Built-in support for coaching agreements means scheduling a series of sessions is fast and convenient. Tracking your client’s progress through your agreement is easy and the flexible scheduling intervals make light work of scheduling multiple sessions for month-to-month or fixed-length coaching programs. Enough with the email tennis. Just let Satori know when you're available and we'll do the rest. Satori's powerful availability tools give you unparalleled flexibility and control. Create one-off or repeating availability schedules, segment your availability for multiple locations, clients or activities, and program changes to your availability in advance. Satori integrates seamlessly with your Google Calendar account to keep your availability current and eliminate double bookings. We’ll even alert you if you schedule conflicting events elsewhere. Whether your clients are across town or across an ocean, Satori takes the hassle out of appointment setting. We auto-detect client timezones and do the math so you don’t have to. Satori emails reminders to your clients before every session so staying organised is easy for everyone. We'll even follow up with clients when it’s time to schedule their next session so you never lose momentum. 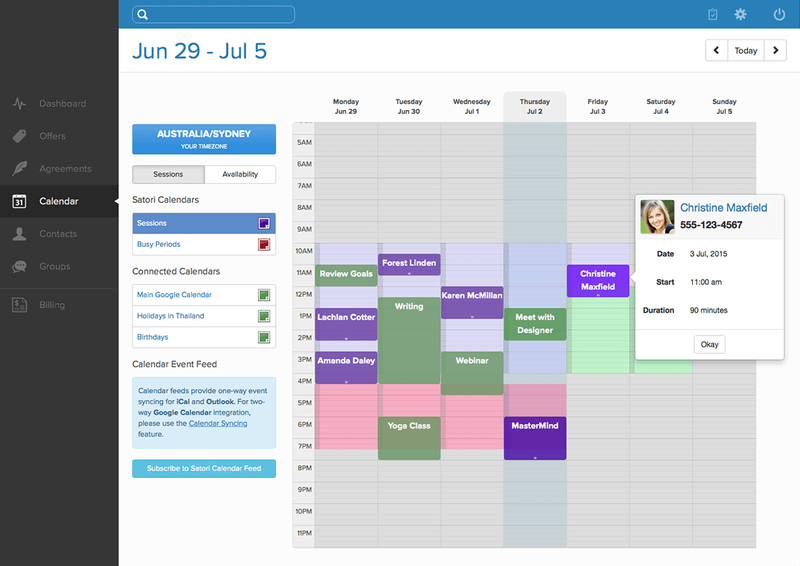 Satori integrates with iCal, Outlook, BusyCal, Google Calendar and more. On your desktop or on the go your calendar is available when you need it, where you need it. Satori’s unique, layered calendar UI gives you the complete picture of your schedule. See your sessions, availability and other calendar events in a single, integrated view. And manage your schedule by drag-and-drop. Your time is valuable. Satori treats it that way. 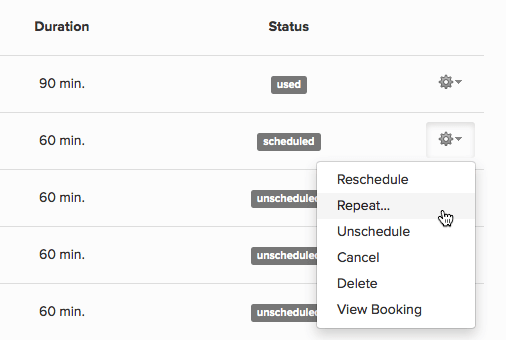 With scheduling controls, you can set your minimum notice requirements and appointment buffer time to avoid last minute bookings, rescheduling and back-to-back appointments. Thanks so much for your product AND service! You make all the things I don't like doing just a couple clicks of a button so I can do all the things I love to do! Absolutely in LOVE with this service! So fricking easy and time saving. Thanks! I so appreciate a solution that means I don't have to be logged into 5 different admin websites just to get one client taken care of. See ya, Wufoo. I have been sending everyone I know your way because I think that Satori is the best and your customer service is exceptional. Thank you for being a big part of my success, and a great example of how to be real, honest, and give amazing service to your customers. You rock! Satori just feels way more personal and real. I actually get excited about logging in each morning, that sounds weird but hey its the truth! When you interact with these guys you'll see why Satori kicks arse over a standard faceless program. Satori’s level of customer service is off the charats BRILLIANT, you have exceeded my expectations in every way. Grow your revenue with integrated payments. With automated invoicing, reporting and online payments, Satori is the fastest and easiest way to turn your coaching practice into a coaching business. Design single payment, monthly or custom billing schedules to suit your practice and your client. Offer payment plans to make your services more affordable. Build more predictable, consistent income streams. Save time and worry with automatic invoicing and payments. 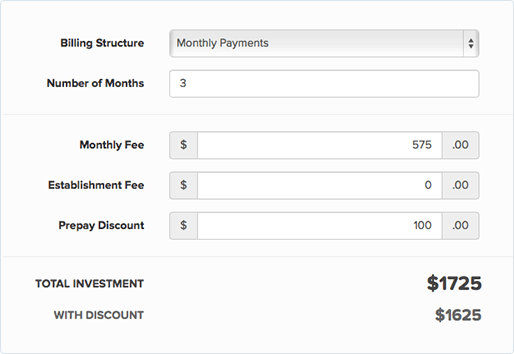 Customise your billing cycles to suit your business and your program. Offer discounts to incentivise advance payment. 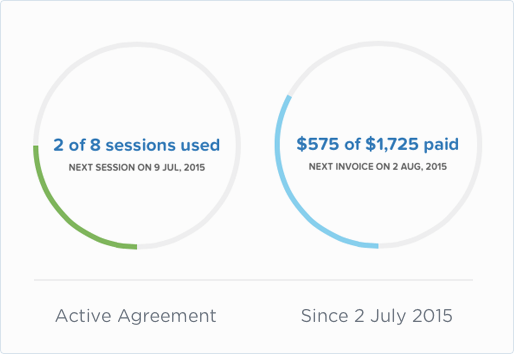 Satori automatically invoices to your clients based on the agreed schedule, and provides the flexibility to update or extend schedules when you need to. With recurring billing agreements, your clients sign up once and future payments are executed automatically—More convenient for clients and more reliable for you. If you receive payments by cash, cheque, or bank wire, you can record those payments in Satori so your client accounts are all in one place. See your net and gross monthly income at a glance. We’ll even figure the tax for you. Track billing histories and total client value, or schedule future invoices with just a couple of clicks. Satori gives clarity to your cash flow. See how much income you can expect, when it's due and who's up to date; so you're never left with an unexpected shortfall. Customise tax settings for your region to automatically add GST, VAT or Sales Tax to your invoices, or disable taxes on a per-client basis. Satori supports billing in USD, CAD, AUD, NZD, EUR, GBP, CHF, DKK, NOK, SEK and MXN. Need another currency? Let us know. Satori integrates with PayPal right out of the box so you can be up and running in minutes. No set-up fees or expensive merchant facilities required. Ready to grow your coaching practice? Audacity International Limited—Copyright 2015. All rights reserved.